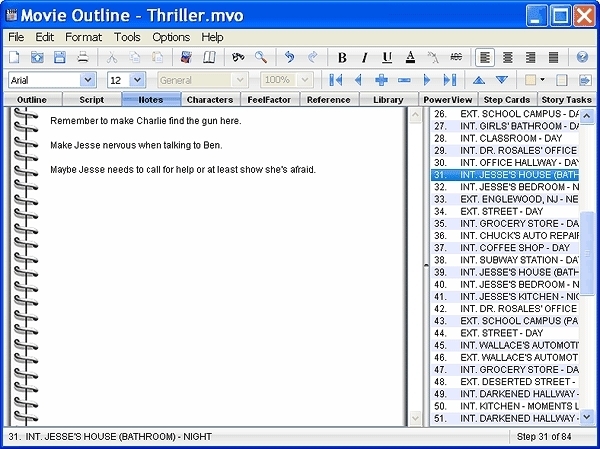 Sign up for a free trial of Movie Outline 3.1 now! 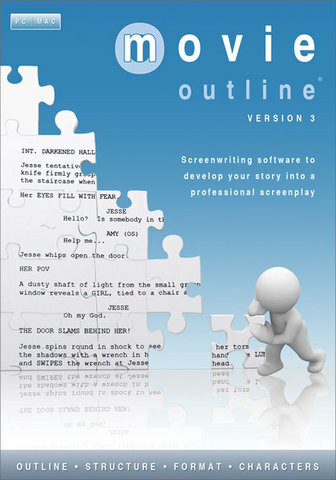 Designed by a produced screenwriter, Movie Outline 3.1 is an all-in-one development package that uses the simple technique of step-outlining to help build your story, characters and screenplay scene-by-scene, letting you focus on each key event of your script without losing sight of the bigger picture. Wondering how to write a movie outline? Let Movie Outline 3.1 do all the work! 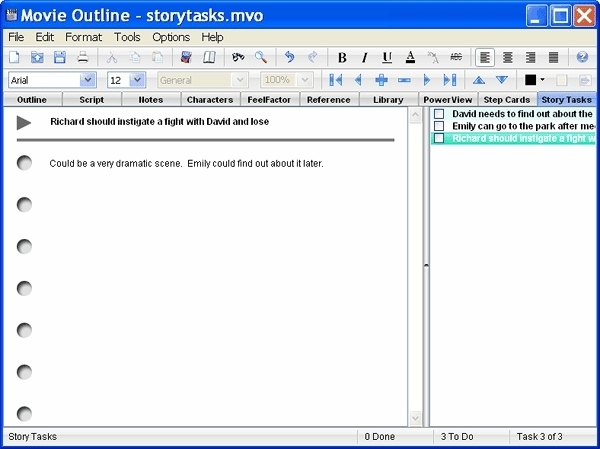 Easily plan your story structure, color-code acts, rearrange scenes, develop and track characters and format your screenplay to industry standards with this movie outline software. You can even gauge the progress of your own story to that of included outlines and analyses of successful Hollywood movies, allowing you to simultaneously compare your own narrative's pacing with the pros. 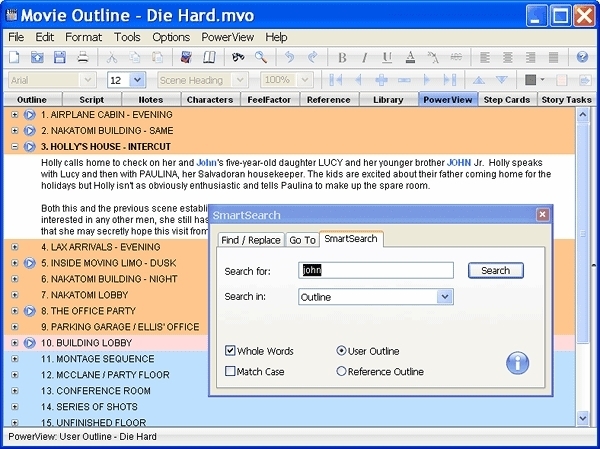 With Movie Outline, you can focus on your story and characters and maintain your creative flow without worrying about the technicalities of formatting your script. It guesses the next character when typing dialogue, automatically suggests scene headings and transitions and lays out your script to Industry standard. Have scripts written on Final Draft? 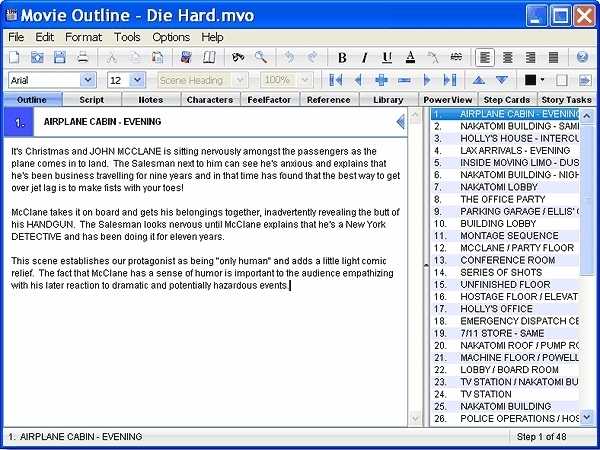 Movie Outline 3.1 directly imports and exports your script to and from Final Draft. 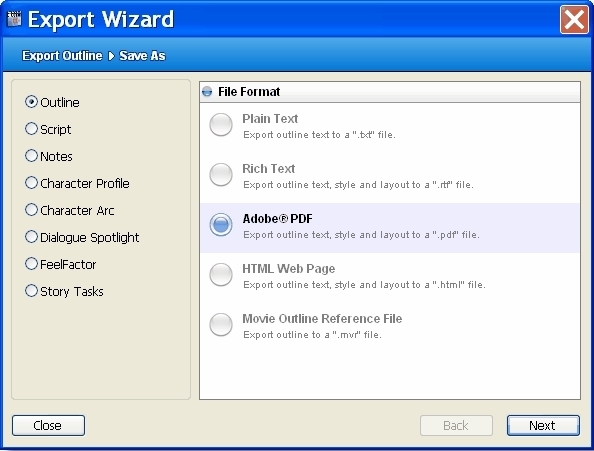 What's more, you can also import PDF, rich text and plain text files with layout, and Movie Outline will automatically reformat them. It also displays scene numbers that automatically update as you type, and prints and export scene numbers to scheduling programs for production. 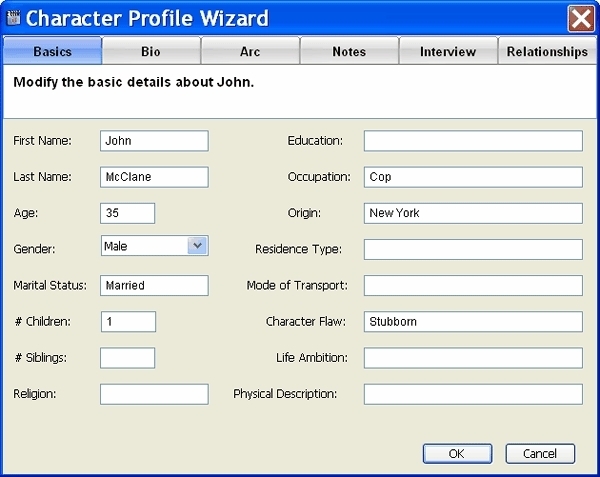 Creating three-dimensional characters is simple with Movie Outline's Character Profile Wizard, which allows you to enter information about each character's biography and intended story arc. You can also answer a series of probing interview-style questions to further build your character's personality, define relationships with other characters, develop their story arcs scene-by-scene and track characters throughout your story. 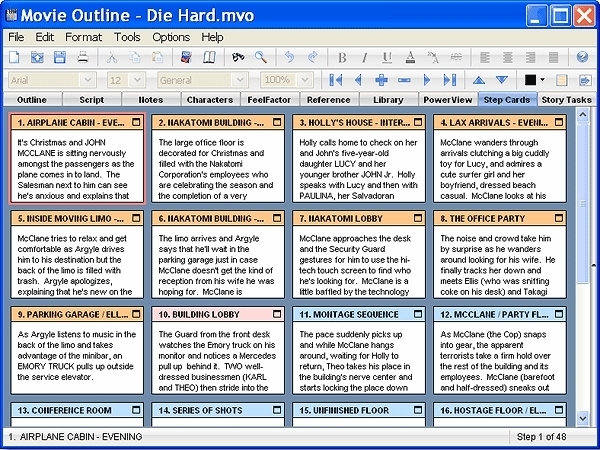 Movie Outline's PowerView enables you to view and customize the structure of your story into color-coded acts, sequences or chapters. 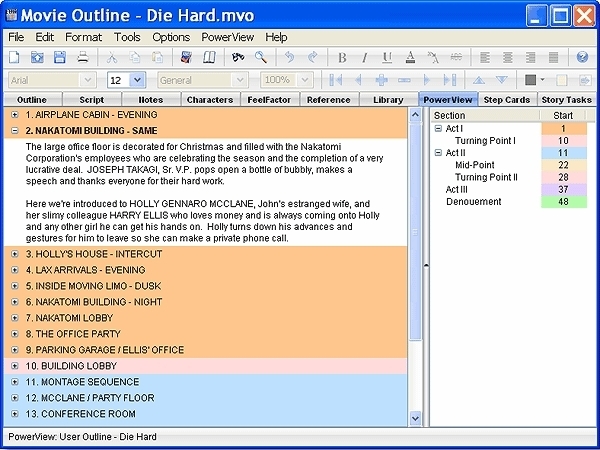 You can save structure templates and choose colors to indicate the various sections and turning points of your story, enabling you to compare your structure with the structure of successful Hollywood movies. 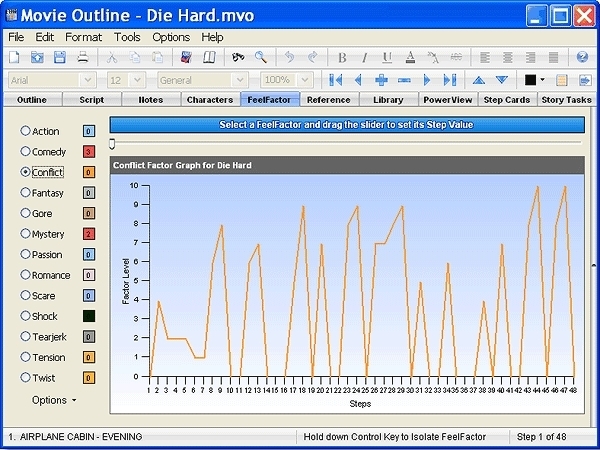 You can load sample structures such as the "Hero's Journey," expand and collapse the content of each step, and view your outline, script and notes in full or just by titles. Dialogue Spotlight is a powerful tool that helps you create unique characters by analyzing dialogue and voice-over throughout your script. It allows you to isolate a specific character's dialogue in your screenplay in order to maintain a consistent style of speech and avoid over-using or unintentionally repeating words. You can also isolate dialogue between two characters to track how they interact as your story progresses, and isolate voice-over to help you follow the path of narration. Creating your outline is easy. Simply write the title and content of your step and use the console to add, delete or move it around in your Outline List. Each step can be a single scene or a combination of scenes, it's up to you! And once you've created your outline, you can write script and notes for each sequence. Steps can be highlighted in any color and reorganized through handy drag-and-drop Step Cards which display your outline, script and notes for each step and can be color-coded to match your act structure. 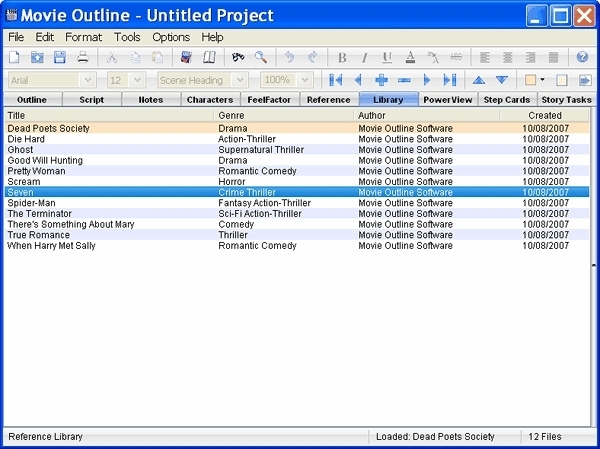 Movie Outline software comes with 12 scene-by-scene outlines and analyses of successful Hollywood movies, which can be viewed simultaneously to your own project to compare structure, pacing and FeelFactors, which are elements of your story that evoke an emotional or intellectual response such as gore, shock, tension, conflict, action, mystery and romance. By setting the level of each FeelFactor for each step in your story, you can visually gauge the pacing and development of your narrative in the form of a colored graph. You can also export your own outline and script into the library in order to compare multiple versions of your project, helping you track changes and plan rewrites. Simply put, Movie Outline is a powerful one-stop shop for all screenwriters - novice and pro! Windows System Requirements: Microsoft Windows 2000/XP/Vista/7 operating system, 56 MB of free hard disk space, 1 GHz CPU or higher, Intel Pentium/Celeron Compatible Processor, 512 MB of RAM, VGA or higher monitor resolution (800x600 minimum). Macintosh System Requirements: Mac OS X 10.4 or above operating system, 84 MB of free hard disk space, 1 GHz CPU or higher, G4 or above PowerPC or Intel processor, 512 MB of RAM, VGA or higher monitor resolution (800x600 minimum).